Taner Akçam holds the Robert Aram and Marianne Kaloosdian and Stephen and Marian Mugar Professor of Armenian Genocide Studies at the Strassler Center for Holocaust and Genocide Studies. He has conducted pioneering research about the Armenian Genocide and is author of numerous books that examine the archival evidence of the Ottoman campaign against its Armenian and other minority Christian citizens, such as: The Young Turks' Crime Against Humanity: The Armenian Genocide and Ethnic Cleansing in the Ottoman Empire. Princeton, NJ: Princeton University Press, 2012. Judgment at Istanbul: The Armenian Genocide Trials, with Vahakn Dadrian. New York: Berghahn Books, 2011. A Shameful Act: Armenian Genocide and the Question of Turkish Responsibility. New York: Metropolitan Books, November 2006. From Empire to Republic: Turkish Nationalism and the Armenian Genocide. London: Zed Books, 2004. 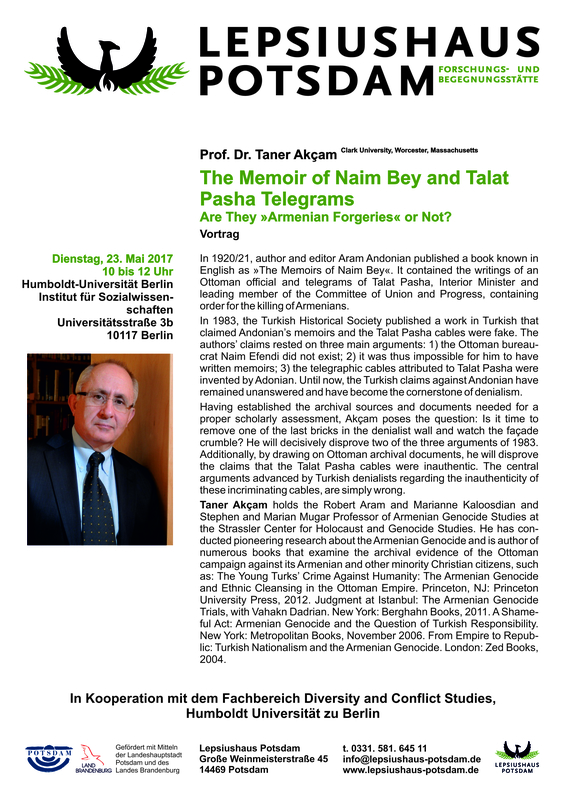 The Memoir of Naim Bey and Talat Pasha Telegrams. Are They »Armenian Forgeries« or Not?